Summer is here, and what better time to list your home for sale than now? A New Dawn Realty aims to be your go to real estate agency in Stokesdale, providing you with the finest real estate services in Stokesdale. 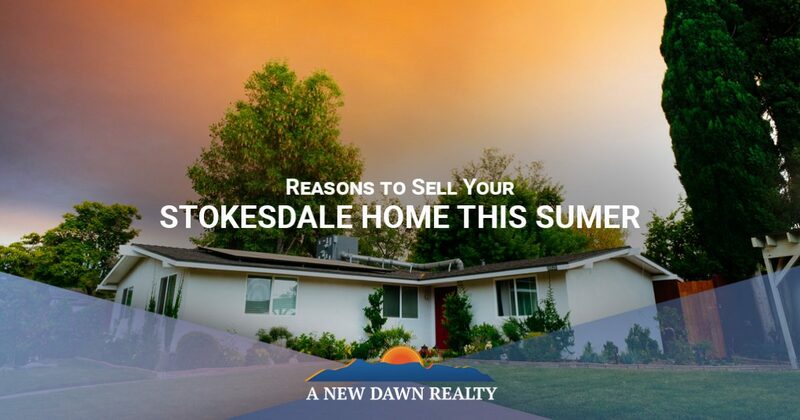 In this blog post, we’ll look at a handful of reasons why you should consider selling your Stokesdale home this season. Contact our Stokesdale real estate agency today to learn more! Whether you purchased your first home with the hopes of someday getting something more, or your family has outgrown the home that once served you well, one reason to sell your home is because you want to upgrade from what you currently have. Families grow, priorities change and the house that was once perfect for you can just as easily become obsolete. Just because your home doesn’t fit your needs, however, doesn’t mean that it couldn’t be perfect for someone else. In the time that you’ve owned your home, it’s entirely possible that it’s increased in value, especially if you put any work into it over the years. Listing your house for sale in Stokesdale will help your home find new life with a new family, while allowing you to find the home that now perfectly suits your needs. Maybe you’re at the age where you don’t need a home that’s quite as large as what you currently have. It may have fit you well while you were raising children, but if your children have grown up and left the house, a home with multiple bedrooms and bathrooms may no longer be what you need. With this in mind, another great reason to sell your home in Stokesdale is to do the opposite of what we mentioned earlier—downgrade to something a bit smaller. Whether you’re looking to find a home that has fewer stairs, something that costs less to heat and cool, or something that’s just a bit cozier for you and your spouse, many people choose to move into a smaller home once their children move out. Like we mentioned above, it’s entirely possible that your home has increased in value since you purchased it, making it easy for you to find the best possible home on the market, no matter how small. As you transition into the next phase of your life by moving into a smaller home, you can take comfort in knowing that a new family will begin a new chapter in the home that you love so much. Opportunities arise and sometimes offers are too good to resist. With this in mind, another great reason to sell your home in Stokesdale is simple-you’re leaving Stokesdale entirely! Whether if you’re looking to retire to a different part of North Carolina or make your way up the coast or elsewhere, relocation happens, and in this case, you have no choice but to sell your Stokesdale home. Those are just a few reasons that you should consider selling your Stokesdale home this season. Whether you’re relocating, upgrading or downgrading, A New Dawn aims to be your Stokesdale real estate agency of choice, providing you with the best real estate services in Stokesdale. To learn more about our Stokesdale real estate agency, contact us today!